I had a call from NASA to be their artist spokesperson for the opening of NASA Art/50 Years at the Smithsonian National Air and Space Museum. NASA commissioned me to paint four paintings for their collection, one of which is included in the exhibit NASA Art/50 Years which opened at the Smithsonian National Air and Space Museum in Washington D.C. through October 9th. For fifty years NASA has been documenting the space program and this is an exhibit of more than 70 pieces from their collection — a true snapshot of space history. The exhibit has been to ten museums, crisscrossed the nation from north to south and east to west. Being with such an august group of American artists commissioned by NASA to document the space program such as Robert Rauschenberg, Andy Warhol and Norman Rockwell is an honor. I was just interviewed on The CBS Evening News and CBS Sunday Morning as well as BBC Worldwide, Voice of America and the Wall Street Journal about the exhibit and my exhibited painting of the x-43. William Triplett in the Wall Street Journal writes, “Artists have continued to gravitate — logically, in some cases — towards space. In 2004, Barbara Ernst Prey attended a test flight of an experimental high-speed NASA aircraft above the California desert. ‘In many ways it (was) a natural progression of what I paint, as I am a landscape painter and watercolorist, ‘ Ms. Prey said. 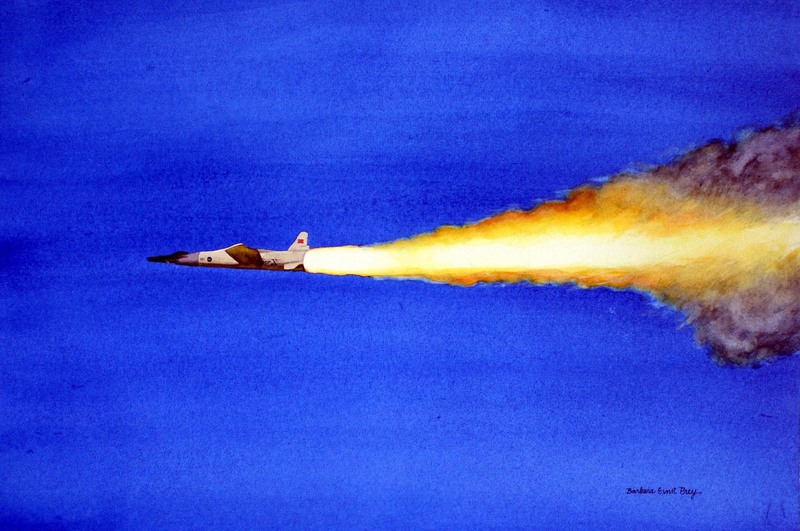 ‘Watercolor lends itself to fragility, freshness, saturate colors and, in this case, speed.’ Her painting shows the aircraft streaking across a vividly blue sky.” I just returned from a second visit to the exhibit to spend more time with the paintings and follow the development of space history as chronicled by my fellow NASA artists. I would highly recommend this exhibit (even if I wasn’t included). I am not a space artist. I paint landscapes and open spaces (in fact I currently have an exhibit titled Open Spaces at Blue Water Fine Arts Gallery in Port Clyde, Maine) but was invited in 2002 to paint the first of four NASA commissions, a painting of The International Space Station. The next commission was The Columbia Tribute which is a very different type of painting. The International Space Station is a collaboration of 16 countries and unfinished so I was painting something that wasn’t all there. I visited the Kennedy Space Center a number of times, and did extensive research before starting the paintings. The Columbia Tribute painting was a memorial to those who lost their lives in the Columbia disaster. The painting was unveiled at the anniversary dinner of the tragedy at the Smithsonian National Air and Space Museum in Washington D.C. A print of the painting, which I signed, had a quote from the president was given to all the astronauts’ families. The image also became the cover for the memorial service program at Arlington National Cemetery the next day. The question for me was how to paint something that carries the weight of the tragedy yet celebrates the lives of the crew members. I decided to do a painting of the lift off as that depicted the moment when the hopes and dreams of the astronauts were realized. Watercolor lends itelf to the energy in the launch and the freshness of the billowing clouds. 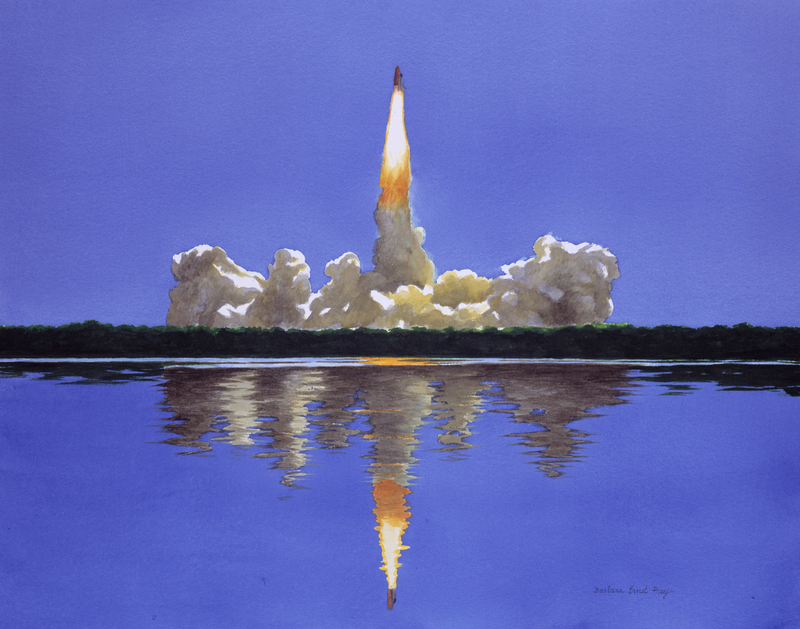 The Columbia Tribute painting as well as The International Space Station are on exhibit at the Kennedy Space Center in Florida. The Shuttle Discovery Return to Flight was the third commission, marking the return to space after the Columbia Tragedy. I went down for the launch — a blue sky background and still water. The painting completes the cycle. My final painting for NASA is The x-43, the fastest aircraft in the world which is included in the NASA Art/50 Years exhibit. The question for this — how to paint the fastest aircraft in the world. In many ways it is a natural progression of what I paint as a landscape painter. It is similar in that I go out into the field to paint and I have spent decades observing the world around me. 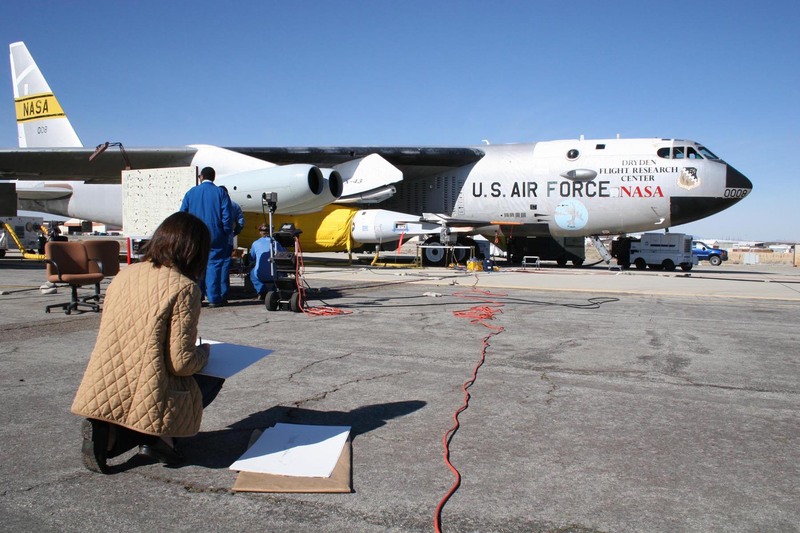 I flew out to Edwards Air Force Base in the Mojave Desert in California to see the launch and was able to draw the x-43 an hour before the launch (I had spent months doing research for my NASA paintings, interviewed astronauts and scientists as I want to know how things work and have an understanding before I paint the paintings — being at a launch and hearing and feeling the rumbles and the awe it inspires is far more informative for the final artwork than looking at a photo). This is probably a product of my academic training at Williams College and Harvard. I was able to be out next to the runway for takeoff and these insights then become the painting. My work with NASA has given me a much larger perspective on the world and the universe. Artists, like scientists, are curious and like to explore and examine life and the universe.